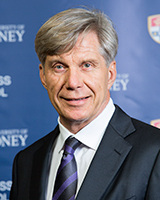 Hans Hendrischke is professor of Chinese business and management at the University of Sydney Business School. He leads the Business School’s China Research Network and chairs the Business and Economics Cluster of the University’s China Studies Centre. Educated at universities in Germany, Taiwan and Japan, Hans did his postgraduate research at the Contemporary China Institute at the School of Oriental and African Studies, University of London. He speaks and writes fluent Chinese and is a frequent commentator on China business and Australia China business relations in national and international media. His team reports with KPMG on Demystifying Chinese Investment in Australia receive wide international coverage. Hans lived in China from 1979 working for the diplomatic service and in the finance industry. In his academic career he was director of the Centre for Chinese Political Economy at Macquarie University, co-director of the UNSW-UTS Centre for Research on Provincial China and head of school at UNSW, and director of the University of Sydney Confucius Institute. Hans’ main research interests are the emergence of China’s private enterprise sector and more recently the global expansion of Chinese enterprise activity, including their investment in Australia and the wider region. The focus of his teaching and PhD supervision is on business institutions from an enterprise perspective and the embeddedness of Chinese entrepreneurship in formal and informal institutions. As an institutional economist, Hans has been one of the pioneers of qualitative research on China’s nascent private enterprise sector for which he interviewed hundreds of Chinese entrepreneurs. Results were published in academic journals and a co-edited book with Barbara Krug China's Economy in the 21st Century: Enterprise and Business Behaviour. His research has evolved from institutional analysis with a focus on informal and formal institutions and government enterprise interaction and institutional infrastructure under China’s decentralised local governance to a more recent focus on theoretical approaches from International Business research on internationalisation of multinational enterprises. He is in particular interested in the projection of domestic form of entrepreneurship and country specific advantages into foreign host markets. Hans’ latest research interest is the migration of institutions and the role of cross-border corporate interaction under China’s Belt and Road Initiative. Work on this topic is done with international partners and draws on his earlier research on border trade and economic regionalisation. In his engaged research, Hans has been leading the Business School’s long-term strategic research cooperation with KPMG Australia which by the end of 2017 had produced twelve annual and special industry reports in its Demystifying Chinese Investment in Australia series. In addition, the Business School’s China Research Network has published thought leadership reports on Australia China business with corporate partners including the Business Council of Australia, the Australia China Business Council, the National Australia Bank and Westpac and received sponsorship from the Australia China Council and DFAT. Krug B, and Hendrischke H (2019) China's institutional architecture: a new institutional economics and organization theory perspective on the links between local governance and local enterprises Asia Pacific Journal of Management, In Press. Hendrischke H, and Li W (2018) The sustainability of Chinese direct investment in Australia Chinese Journal of Australian Studies, 1 (1), 83-102. Hendrischke H, and Li W (2018) Internationalisation of Chinese Firms in Advanced Economies: The Role of Dynamic Capabilities Australia and New Zealand International Business Academy (ANZIBA) Conference; Australia and New Zealand International Business Academy, Brisbane, Australia. Li W, and Hendrischke H (2018) Demystifying Chinese Firms Investment in Advanced Economies: The Case of Australia Australia and New Zealand International Business Academy (ANZIBA) Conference; Australia and New Zealand International Business Academy, Brisbane, Australia. Ferguson D, Dent H, Barber V, Hendrischke H, Li W, and Zhang M (2018) Demystifying Chinese Investment in Australia: June 2018; KPMG, Sydney, 3-42. Ferguson D, Dent H, Yao J, Hendrischke H, and Li W (2018) Demystifying Chinese Investment in Australian Healthcare: Capitalising on China's healthcare reform; KPMG, Sydney, 2-25. Li W, and Hendrischke H (2017) Motivations of Chinese firms in developed economies: the case of Australia 43rd European International Business Academy (EIBA) Annual Conference; European International Business Academy (EIBA), Milan, Italy. Ferguson D, Hendrischke H, Dent H, and Li W (2015) Chinese Investment in Australia: the Australian and Chinese Perspectives Chinese Investment in Australia; China Renmin University Press, Beijing, 64-73. Ferguson D, Hendrischke H, Dent H, and Li W (2015) Demystifying Chinese SOE Investment in Australia Chinese Investment in Australia; China Renmin University Press, Beijing, 37-45. Ferguson D, Hendrischke H, Dent H, and Li W (2015) Australia-China Investment Outlook Chinese Investment in Australia; China Renmin University Press, Beijing, 74-81. Ferguson D, Hendrischke H, Dent H, and Li W (2015) Overview of Chinese Investment in Australia Chinese Investment in Australia; China Renmin University Press, Beijing, 6-35. Hendrischke H, and Li W (2015) China Eastern Airlines Co Ltd: Links of Love between Australia and China Chinese Investment in Australia; China Renmin University Press, Beijing, 162-169. Hendrischke H, and Li W (2015) The 2014 Australia-China Trade Report; Australia China Business Council (ACBC), Melbourne, 10-71. Hendrischke H, Li W, Ferguson D, Dent H, Lu T, Silva K, Davies L, Ong D, and Whitby M (2015) Demystifying Chinese Investment in Australia: May 2015 Update; KPMG, Sydney, 2-33. Hendrischke H, and Li W (2014) Chinese Institutional Entrepreneurs Entrepreneurial Women in Asia: Case Studies & Perspectives; Myanmar Heritage Publications, Myanmar, 198-202. Hendrischke H, and Li W (2014) The Teahouse - China Entrepreneurial Women in Asia: Case Studies & Perspectives; Myanmar Heritage Publications, Myanmar, 60-66. Hendrischke H, and Li W (2014) The Serial Entrepreneur - China Entrepreneurial Women in Asia: Case Studies & Perspectives; Myanmar Heritage Publications, Myanmar, 94-100. Hendrischke H, and Li W (2014) Chinese Direct Investment in Australia Research on the Impact of Global Economic Integration and Information Networking on Sustainable Corporate Development; Nanjing University Press, Nanjing, China, 268-278. Ferguson D, Hendrischke H, and Barber V (2014) Demystifying SOE Investment in Australia: A report prepared for the Business Council of Australia. Ferguson D, and Hendrischke H (2013) Demystifying Chinese Investment in Australia: Update March 2013; KPMG, Sydney, 1-23. Hendrischke H, and Li W (2012) Chinese Outward Direct Investment (ODI) in Australia 1st China Studies Centre Annual Conference, Sydney. Hendrischke H (2012) The other side of competition: Foreign firms should focus more on the diversity of local competition China Daily, USA weekly edition . Ferguson D, and Hendrischke H (2012) Demystifying Chinese Investment in Australia: China's outbound direct investment in Australia; KPMG, Sydney, 5-18. Ferguson D, Bray M, and Hendrischke H (2012) Demystifying Chinese Investment in Australia - The Energy Imperative: Australia-China Opportunities; KPMG, Sydney, 2-6. Hendrischke H (2011) Redefining its role: the Chinese Communist Party turns 90. Asian Currents (September), 1-4. Epper M, and Hendrischke H (2011) Australia & China: Future Partnerships 2011; KPMG, Sydney, 3-53. Epper M, and Hendrischke H (2011) Demystifying Chinese Investment in Australia - The Growing Tide: China outbound direct investment in Australia; KPMG, Sydney, 3-15. Hendrischke H (2010) Ten Years Hence: A Decade after Its Launch, Beijing Re-assesses the Go West Strategy European Business Forum (May), 1-2. Krug B, and Hendrischke H (2010) China's Institutional Architecture: Interpreting the Links Between Local Governance and Local Enterprises Institutionelle Ursachen des Wohlstands der Nationen; Duncker & Humblot GmbH, Berlin, 211-229. Hendrischke H (2010) Ten years hence: A Decade after Its Launch, Beijing Re-assesses the Go West Strategy BusinessForum China, pp. 18-20 . Krug B, and Hendrischke H (2009) Smart Business Networks in Chinese Characteristics The Network Experience: New Value from Smart Business Networks; Springer, Berlin, Germany, 179-189. Krug B, and Hendrischke H (2009) China’s institutional architecture: Interpreting the links between local governance and local enterprises Institutionelle Ursachen des Wohlstands der Nationen; Duncker & Humblot GmbH, Berlin, 211-229. Krug B, and Hendrischke H (2008) China’s Institutional Architecture: A New Institutional Economics and Organization Theory Perspective on the Links between Local Governance and Local Enterprises. Krug B, and Hendrischke H (2007) The Chinese Economy in the 21st Century: Enterprise and Business Behaviour; Edward Elgar Publishing, UK. Hendrischke H (2007) Networks as Business Networks The Chinese Economy in the 21st Century: Enterprise and Business Behaviour; Edward Elgar Publishing, UK, 205-225. Hendrischke H (2006) Corporate locality and translocality of private enterprises in China Translocal China: Linkages, Identities and the Reimagining of Space; Routledge imprint of Taylor & Francis, London, 93-108. Krug B, and Hendrischke H (2006) Institution Building and Change in China. Krug B, and Hendrischke H (2006) Framing China: Transformation and Institutional Change. 新浪新闻 (China) reported on a report co-authored by Professor Hans Hendrischke from the Business School and KPMG finding Chinese investment in Australia has fallen 36 percent in the last year. SBS Radio German interviewed Professor Hans Hendrischke about an annual report by KPMG and University of Sydney Business School finding Chinese investment in Australia has fallen 36 percent in the last year. ABC Radio National interviewed Professor Hans Hendrischke about an annual report by KPMG and University of Sydney Business School finding Chinese investment in Australia has fallen 36 percent in the last year. Sky News, MSN, Yahoo, The Australian and Tribunnews (Indonesia) also mentioned on the findings. The Australian (including an analysis), ABC (Online, News TV), The New Daily and Your Money (TV) also reported on the findings and The Conversation published an article by Professor Hendrischke and Dr Wei Li about the findings. Australian Financial Review, Yahoo! Finance and Business Insider quoted Professor Hans Hendrischke about an annual report by KPMG and University of Sydney Business School finding Chinese investment in Australia has fallen 36 percent in the last year. Chinese investment in Australia is growing strongly and involving new industries such as healthcare. Professor Hans Hendrischke discusses the positive findings from his research with KPMG on Chinese investment for both China and Australia.